Examining and buying art is an introspective process where you need to be true to yourself. Art curator Andy Fairgrieve shares tips on how to choose the right art pieces through instinct, and not by price tag. Examining and buying art is an introspective process where you need to be true to yourself. Judge your motivations at length - don't pick up an artwork simply because of its exorbitant price tag. Appreciation is subjective, and learning to respect your instincts and perceptions with regard to a piece could be your guiding light. After buying that first piece of art, explore further, discover new artists, head to galleries - don't let up in the quest for artistic excellence. Exposure to new trends and artists enablefine-tuning of your aesthetic senses. Chances are, you will be more confident while making your next big art purchase. Making a decision at this point is critical - should you stick to one particular artist or explore works across genres? Art is reflective of your persona, and a commitment to one artist is indicative of a personality that treasures organisation above all else. On the other hand, the trajectories of emotions drawn from the distinctive styles of different artists appeal to discrete facets of a relatively more complex person. Works of art spanning mediums, genres and levels of accomplishment make for a truly eclectic collection that you can be proud of. Art interacts with the architectural elements and decor of your house to turn it into a home. 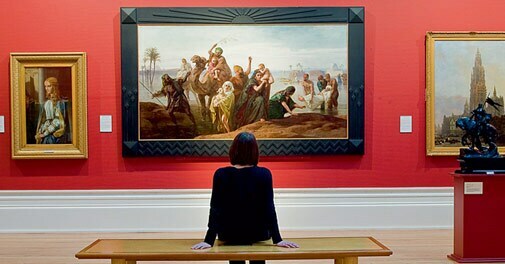 In this regard, the display of artwork needs vision and planning. For instance, a contemplative piece of work is best displayed prominently on a vast expanse of a wall. Paintings should not be exposed to harsh, natural light that can affect their quality. Fragile, smaller artworks can add a dash of edginess to well-furnished rooms. Avoid putting these up in a stairwell, where there is a possibility of brushing against them.